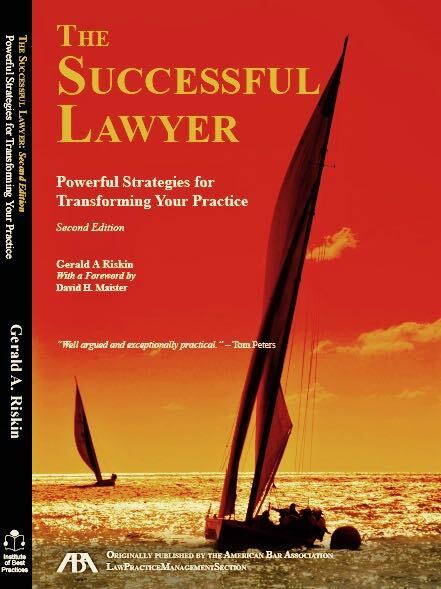 Global management consultant and trusted advisor to many of the world’s largest law firms, Gerry Riskin has written this comprehensive and inspirational book to explain how lawyers can transform their lives – making them more exciting, fulfilling, and profitable – by taking control of their destiny. Going beyond simple concepts and theories, this book is packed with practical advice that you can implement right away. Some of the world’s foremost law firms have paid tens of thousands of dollars for the information in this book, and now you can obtain it for a fraction of that cost and review it again and again at your leisure. Change your life and your practice now with this inspiring new book. Tom Peters, the highly acclaimed writer on business-management practice and author of In Search of Excellence, has described The Successful Lawyer as “Well argued and exceptionally practical.” Join the thousands of other lawyers who have used this book to make their practices more rewarding. . . both personally and economically.